It’s no secret that Houston is hot and humid — and also no secret that water is one of the best ways to beat the heat. Rather than hopping in the pool, try grabbing a paddle and stepping into a kayak. Houston and its surrounding areas have miles and miles of waterway trails, and with the area’s abundance of birds, trees, and aquatic life, it’s definitely worth the effort. And don't worry — kayaks are steadier than they look. It’s hard to fall out. Whether you have your own boat or need to rent one, are an experienced paddler or don’t know where to start, you’ll find plenty of locations and resources to spend a day on the water in and around Houston. Here are five popular spots to get you started that are within a morning’s drive of the city, but be sure to check out the Texas Parks and Wildlife Department’s Texas Paddling Trails page for a whole host of options. This is as Houston as it gets. A 26-mile trail that stretches from the west side of the city right to downtown, the Buffalo Bayou Paddling Trail has 10 access points to drop into the water and will land paddlers in the heart of H-town. If you don’t have your own, kayak rentals are available through Bayou City Adventures. Being that this is a bayou with a current and not an open waterway, consider it a one-way trip, which may require some logistical planning. There are shuttle services that provide rides and parking along the waterway, but the parking situation is pretty limited, especially the closer to downtown you get. Each year, the bayou helps to host the Annual Buffalo Bayou Partnership Regatta. Hundreds of paddlers, from beginners to experts, participate in this popular locals festival. Even if you don’t sign up to paddle, it’s worth a watch. For a paddle with more amenities nearby, The Woodlands is a good option. It has the advantage of being in an urban area while feeling somewhat cloistered in among the trees. You can row through the trees to a dock connected to a playground, or through a waterway with restaurants and shopping on either side. Some paddlers set out in the evening so that they’re on the water during concerts at the Cynthia Woods Mitchell Pavilion — there’s no view of the stage, but sound drifts out of the open amphitheater. There are plenty of docks to get in or out of the water with your own kayak, or you can rent from facilities within The Woodlands. Lakes Edge Boat House and Park, as well as Riva Row Boat House, both rent kayaks and stand-up paddleboards. Lifejackets are included for people, as well as dogs. For a saltwater paddle and a view of the Gulf Coast, head southeast to Galveston Island. The state park has three official paddling trails between 2.6 and 4 miles long. These trails are on the bay side of the island, between the island and the mainland, rather than on open ocean. This makes for gentle waters that are accessible to all levels of paddlers. There is typically plenty of parking in the state park, except for in the summer when beachgoers crowd in. Admission to the state park is $5 per person 12 years and older. There are no rental facilities in the state park, but where that amenity lacks, hospitality takes its place. The state park, along with Friends of Galveston Island State Park, hosts frequent kayaking events like beginners classes and sunset paddles. Pro-tip: If you RSVP and go to one of these events — which are free outside of the park entrance fee — they will provide kayaks and gear for you to use. Moving from the sand to the swamp, this state park is 120 miles northeast of Houston in Jasper, Texas. While much of the scenery surrounding Houston looks similar, this park has a variety of nature views. 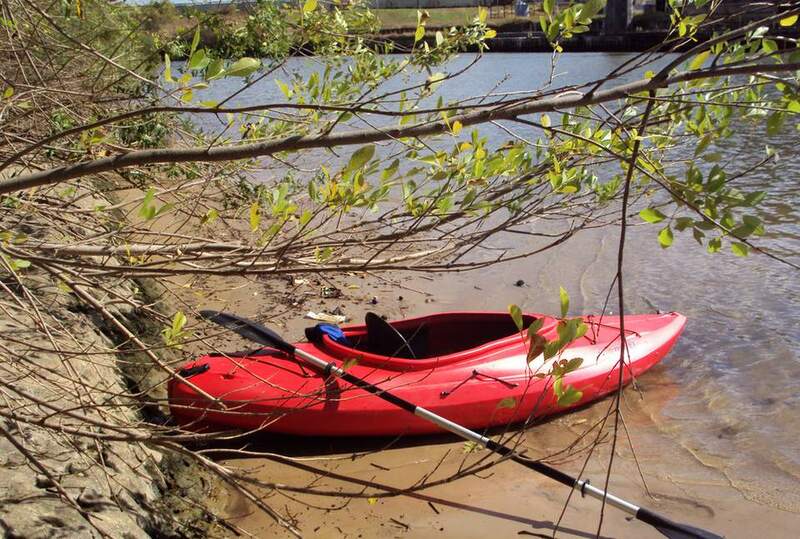 Unlike many kayaking spots, which are large open areas, the trails here cover winding sloughs and the Neches River. You’ll navigate your boat through tunnels of Cypress trees, lily pads, and Spanish moss. An alligator or two might swim by — but don’t worry; they’re not the aggressive ones. Campsites right on the water are available, and Texas Parks and Wildlife offer rentals within the park that will cost you less than $20/day — life jacket and paddle included. Heading the other direction, the San Marcos River is just a little further, 145 miles straight west of Houston near Luling, Texas — just south of Austin. Also known for its ideal tubing conditions, this is the spot for a paddler craving clear water. Bring your kayak and park for free, or rent in town and use a shuttle service. Plenty of spots are available for drop-in, but those looking for a more organized paddle can check out the Luling Zedler Mill Paddling Trail. This six-mile water path will take you over clear water and through pecan trees. One thing to keep in mind about this spot is that there is a dam past the mill, so the water level can vary. This typically only presents a problem when levels are low and there could be ​a risk of scraping a kayak along submerged branches.